Last weekend I did an interview for an article on the history of climbing in Santa Barbara. 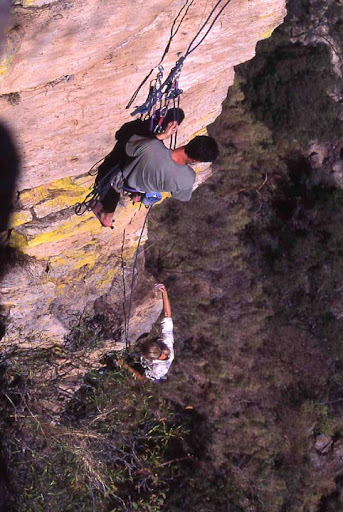 It brought back a lot of memories, many that I think will make for great reading, so for a short time the Friday Psyche will feature some tales on the history of climbing in and around Santa Barbara, California. 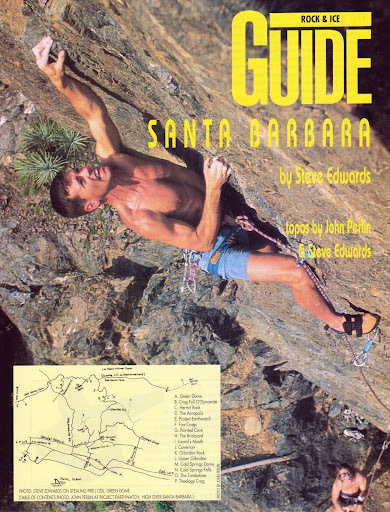 I spent a good portion of my life living in Santa Barbara and that most of this time was consumed by developing the climbing there abouts and writing about it. It’s one of the only places I’ve lived that actually felt like home and, despite a dearth of quality rock, a decade or so of my life was spent hell-bent on turning it into a climbing destination. And while that never happened those years were hardly wasted. Besides learning a ton about physiology, diet, and training, never before or since has life been filled with as much day to day passion. I guess it all didn’t amount to much in the guise of Western ideals but, man, it was fun. Bob Banks has become the de facto historian for SB. Most of this series will point towards his blog. Let’s begin with the interview with local climber Stan Scheider. Hopefully pique your interest enough to keep tuning in for some good old fashioned lore. Btw, I don’t feel bad scooping it since only a small part will be used, interwoven with info from most of the other principles in the story. 1. Any interesting stories on the old climbing routes and bouldering? Sheesh, tons. During the Allez Magazine years our house (The Castle) was a flop house for climbers worldwide. I traveled a lot during the early 90s, competed and wrote for the mags and knew a ton of climbers and I don’t think there was a time during, at least the Allez years, where there wasn’t at least one foreign climber living there, and often there was 5, 10, sometimes 15 camped in the back. Before Allez I lived in either the shop or my van, which were also often occupied by others. One thing that I have found interesting is how the scene has gotten so quiet since I left. I was really into the public service of development, even more than sending my projects. I wanted to make SB a good place to climb and ended up leaving the area with a lot of un-redpointed routes scattered around, hopefully to inspire the next generation. Hardly any of them have been done! Only Bernd Zeugswetter and lately Andy Patterson have shown any interest in this at all and, in fact, I think they might have the only ascents of some of my routes. It’s been 12 years since my guide came out and there’s been very very little activity on the scene, and most of that has been down in Ventura/Ojai and up at Owl Tor, where I have still been active. During the 10 years I was in SB the areas route count probably tripled. This still puzzles me. 2.Historical climbers in the area? A lot of big names have come through the area but very few have left a mark. Chouinard lives here but never did much locally. Hans Florine is a part of our crew and has done a few things, including the Central Coast’s first 5.14, but mainly focused on objectives elsewhere. Kevin Thaw is one of my best friends and has lived with me on and off for periods and lots of famous European and American sport climbers have been on my projects but no one has spent enough time to do much. Mainly they’d use SB as a place to chill and train (we had a great training facility) for more famous projects. The developers were all local guys and not just our crew. Before me Steve Tucker was the keeper of the flame. He did some development but was also very active recording what went down, writing two guidebooks and some magazine articles. If it weren’t for him the history might be completely based on rumors. During my time there was kind of two camps and we didn’t always get along but the competitiveness probably spurred it on because, for sure, it was the pinnacle of route development in the area. Our crew was mainly me, Phil Requist, John Perlin in SB and Russell Erickson and Reese Martin in Ventura, and a bunch of other friends who’d help out here and there (Utahn Stuart Ruckman for a short time who was way better than everyone and opened our eyes to possibilities and then Wills Young a couple of years later). Then there was the Pat Briggs, Tony Becchio, Dave Griffith crew. Those three guys, especially, were very good climbers and did a lot of exploring and route development. They were much more the driving force than others who may have been more famous like Chouinard or Hans or Scott Cosgrove (who did one notable FA, Smooth Arete). We had the odd heated moment but mainly it was civil. 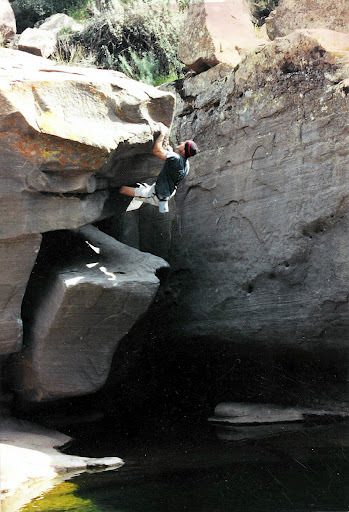 The funniest story, which Stuart laughed at later but was pissed when it happened, was one day at Cold Springs Dome when DGriff “Rock Warrior’d” (trying to pull people off the rock from the Masters of Stone films, which he starred in) Stuart for climbing Stealing Fire (13b–hardest route in the area at the time) before him. Two other guys worth mentioning are Jeff Johnson and Paul Anderson and what they did at The Swimming Hole (Tar Creek) as that place was a decade or two ahead of its time. They were true visionaries in the bouldering world. 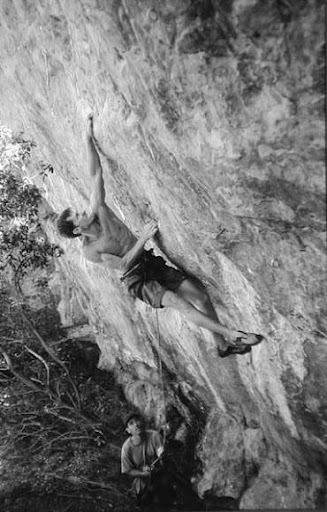 All of the bouldering development that I did, which was extensive, trickled down from them inspiring Wills who inspired me. They completely changed our perspective (Wills, myself, and then Bob Banks when he got here) to ways to develop bouldering by looking at a new style of lines in non-traditional boulder fields. Now it seems normal but, back then, sans pads, most people would dismiss a place like The Swimming Hole and it took those guys to see the potential. This bit o’ history got cut out of my guide (by Falcon because Tar Creek was closed at the time and I think they were afraid of getting sued or something) and it’s important. 3. More detail of any old hang outs, The Shed, The Castle or any other plywood hangout areas with any stories? A lot has been written in Allez, various guides, and Wills did a Castle article for Climbing (or R&I). So many stories. It was really a hub for west coast climbers, even if it was more about fun and training than actual local climbing. 4. Any info on your old video/climbing store in the 90s. This is where that hub began. I was very psyched, as I said on the public service of making SB a good place to climb. I held competitions at UCSB (on a terrible little wall) that drew big crowds. Everything happened around @#$%! Video & Climbing Boutique. You’d come into the store and there would be people training, watching movies, drinking beer. Some people never left the shop. Really, Phil Requist, Todd Mei, and others were in the shop whenever they weren’t climbing or at school. 5. Where was the place locally in the 80s, 90s to get climbing gear. After the BD lawsuits Chouinard became very disinterested in climbing and supported it less and less until giving up on it altogether. So then we just had my little shop and Mountain Air sports. I actually sold a fair amount of gear. I sold stuff pretty cheap at my shop because, again, I wanted people to be psyched on climbing. I was more into the public service than making money. I also designed the GVAC climbing wall for free for the same reason. 6. Did you make any of your gear? Training gear yes. Climbing no. We were always tinkering with better ways to train. Trying to change the sport. The sport evolved a ton in those years and we probably had something to do with it. If I knew then what I know now, after all those years of trial and error, about training I would have climbed much harder. 8. Any info on Yvon Chouinard climbing in S.B.? He was into big mountains. We don’t have any of those so not really. He did, like, two FAs. One was with Chris Bonnington of Himalayan fame, which is super rad (at San Ysidro). 9. Any info on 1950s Herbert Rickert? No, but he was very active very early so he was probably burly and adventurous. All of those old guys, climbing on terrible rock without decent gear, must have had a great sense of adventure. 10. Any info on Hans Florline in SB. Him and is wife was going to come down to Ojai for a School Climbing event, but fell through. 11. 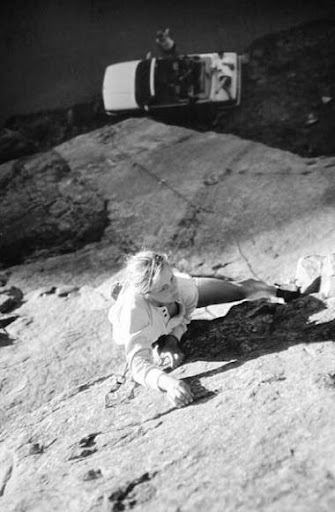 Any info on Tiffany Campbell/Levine, Peggy Oki, or boulders of the 70s Doug Hsu and Chuck Fitch climbing in S.B.? Tiffany and Jason came around a lot but never did much (other than climb strong–though she and I had an epic chili pepper eating contest at Nationals one year). Peggy still climbs and lives in Ventura. Not much into development as she’s more of a soul surfer/skater. I hear Doug and Chuck were very strong, maybe still are (rumors around Doug was climbing 5.13 wherever he was living during the 90s) but I never met them. Like so many others they spent some time and moved on. Their boulder problems are still hard. They must have been on the cutting edge for their day. 12. 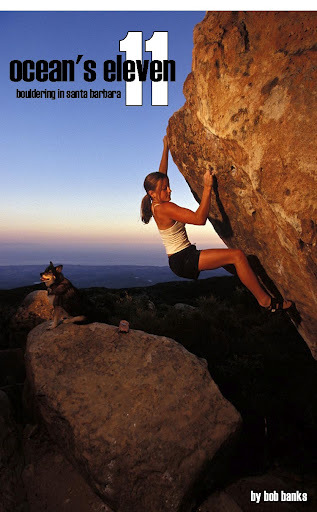 Any other interesting facts like how did you get into climbing and discover the S.B. hills. For me it was completely serendipitous. I moved here to go to grad school, basically. My brother was in undergrad at UCSB and we knew IV (Isla Vista) needed a video store so that’s what I did. I kind of thought I’d run my course as a climber since I’d quit my job and moved to Yosemite and climbed everything I’d wanted to. I was ready to move into another chapter of life. But for some reason my psyche fully returned in SB and it became all I cared about. I was, like, I can spend my little bit of money on school or I could travel and climb full time and I did the latter and it was fantastic. I had a van and everything I owned was in it (except the store). I didn’t have a home. I worked, trained, and went climbing. Life was simple. 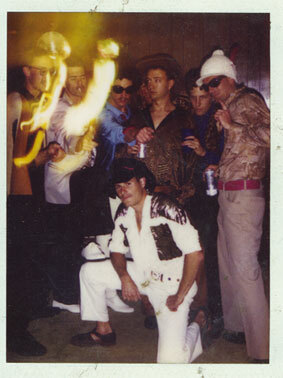 It was probably the coolest period of my life. Pity we never met when I was in grad school at Brooks from 89 – 92. Didn't have a lot of climbing partners there so I was more into cycling and scuba out at the islands. Never knew about your shop but I wasn't out at IV much. I did boulder a lot on those nasty flood channel walls with the glued on holds. Ouch! Ah, Pedragosa St. Yeah, spent a lot of time there, too. It was awful! And the Ventura Wall also terrible. And the bridge in Santa Maria where Phil claimed his glue up was the best route in SoCal.THe Splash Zone, created years later, was much better but still making lemonade is the best way to describe it. Big Air! You're outta there! Pretty sure Peggy still lives in Carp, and it should be noted that she was inducted into the Skateboard Hall of Fame this year. Peggy rules! Hey Steve, Kind of a tangent from the post. Fairly new to climbing. How would you incorporate hangboard exercises for finger strength into a program like X2?